I was born and raised in Texas. I decided to move back to this state to be close to my family and because I probably couldn’t handle the winter in many of the other states. I’d rather deal with the heat than try to put on enough clothes so I don’t feel the cold down to my bones. Having said this, over the past several weeks the temperature has bounced from 80°F (27°C) one day to below or near freezing the next. We’ve already experienced a Canadian cold front and then weeks later after the true Texas weather was back the Arctic cold front made its appearance. These cold fronts have also come with rain and that’s a lethal combination for getting me out of the house and running. I finally made a rough plan so that I could build up my base before January. The only problem was convincing myself to get out of my warm, cozy bed at 5:30 am with the sun still tucked in and the weather gusty and cold. I’ve been slacking on my weekday runs, but I did make it out one Sunday when the Arctic weather was in full force. I looked at my weather app before walking out the door to see what I was getting myself into. 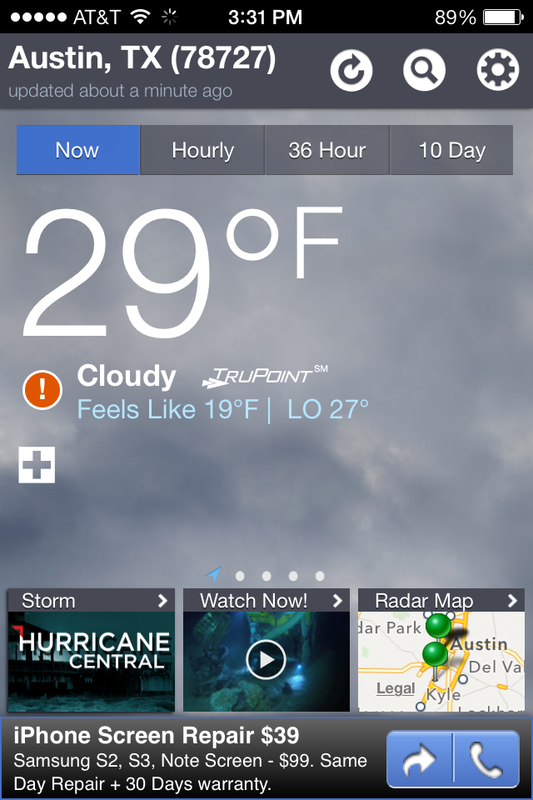 With the wind chill factor, it was 19°F (-7°C). I only had so many clothes that I could layer on me. For the first mile, it felt like my feet were numb. The second it was my face and then my hands. I seriously wondered if my runny nose would actually freeze. Thankfully nothing froze and I made it through my run. The warmer weather was back for my run this afternoon, but it’s supposed to freeze yet again tonight. My goal is to take advantage of the warmer days and bundle up with a cup of something warm on those days when it’s just too plain cold to get out there. It was my mid-week run: an early Wednesday morning, mist already rising over the river, still icy cold out. Gloves and woolly ear-warmer a given. That day I decided to follow the Moselle river which leads to Trier in Germany, instead of the smaller, swan-filled Sauer river that usually keeps me company. I marked out two miles to do a there-and-back route. I would get to the next village, spin on my heels and try to burn it back slightly faster into the biting wind. The walking (or in this case, running) and biking path is right next to the river. That morning traffic was high, lots of boats shifting their wares from Germany to Luxembourg and France and back. Barges piled with scrap metal, what looked like coal; others with their goods hidden. Watching the boats meander the water’s bends took my mind off running. It was easy, striding out, breathing out my own personal fog, ignoring the cold. Just me, the boats and the river. I turned at two miles to head back. Ahead of me on the river was now a boat that had just passed me. I focused on my music and stride. On my right over the fields I had cars burning past me. But if I looked to my left, well, the boat was getting closer. Was I running faster than the boat? Eyes on the path, I stepped it up a little. I didn’t want to keep glancing towards the river, the barge was long, but wait… yes, I was winning this race! As one song finished and another started, that short, silent pause was filled with metal clanging against metal and shouts. I turned. I was the only one on the path. Then I saw them: two men on the control deck of the barge cheering me on. I waved. The music started again and I was off. I had a slight detour getting back to Luxembourg and crossing the other river to get home – could I keep in front of the boat? I dug in, hoping they wouldn’t up their speed or let me win. This was a real race, man against machine. Who would win? I sprinted my ‘home straight’ and turned to see the barge coming up behind me. The sun was trying to poke out and I stood stretching, watching its length pass me by as the sun tried to poke out from its grey morning blanket. When those rays hit the side of the boat I saw it. Gotcha. The boat’s name. Don’t tell me how fast they go. I don’t care. My boat race. My win. Gotcha. There’s a smoked ham in the Black Forest which smells and tastes divine. I’m not sure I can do it justice in my description here: it’s not just smoky and it’s not just hammy, it’s a whole new level of cured meat fabulousness. And the taste is a lingering wonder of smouldering meaty goodness. Your ham and cheese sandwich will never be the same again. Has M&MRC taken up writing a food blog? you ask. No, but we need to be clear about something. Food is a wonderful motivator. Let me explain. 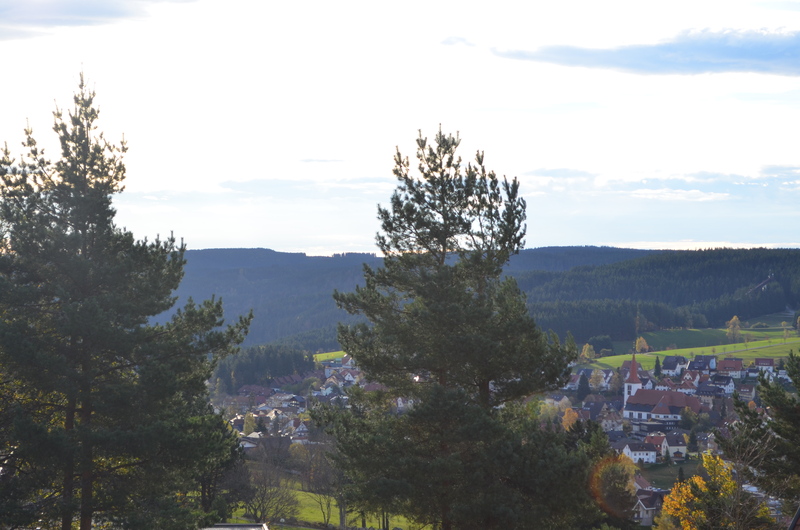 My husband and I had rented an apartment at the top of the hill in a small village outside Triberg. We had views down to the village and the hills and forest beyond. When we arrived I had joked about having to walk up the hill with your shopping (there were a lot of old, retired folks living up by us). I had also joked about the road up to our apartment being an excellent toboggan run in winter. Joke not, Laura. After a weekend of typical holiday excess – champagne, cherry wine, black sausage, breakfasts that last an hour and many local beers – we woke on the Monday morning to a sunny scene below. We needed provisions. And it was also time for a run. I’ve said it before and I’ll say it again. There is something very noble about running on holiday. So, nobly, we donned our running gear and headed out. When I say out, I mean down. Because there was no other way to go. The road led down, the village was down, the German deli was down, the park was down. We had no choice. As we ran, breakfast smells wafted into the streets from small pensions. It was the smell of that special ham, a smell to die for. “We need to get some of that stuff,” I said to Martín as we rolled down the hill. 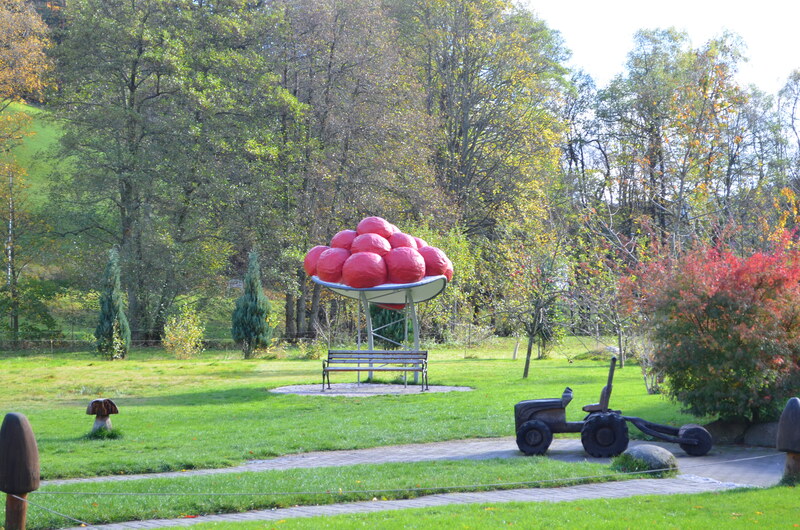 We went past the little supermarket and into a park. “OK, once round the park and then we go get breakfast.” I don’t know why I didn’t think about how we were getting back. I felt like one of those geek runners in the shop: trainers, running leggings, headband. The old locals looked at us funny. But I didn’t care. I needed a packet of that smoky ham, a round of that wonderful dark brown bread with sesame and pumpkin seeds, some of that wonderfully heavy hard cheese. Martín loaded up the backpack and took care of that. We stepped out into the street. And then I remembered. The way back wasn’t back. It was up. It started mildly enough. It actually felt OK going up, the opposite muscles getting a workout they had missed out on on the way down. And then the road winded further, curving upwards, steeper and scarier. I knew the last part was the worst, so I focused on Martín just ahead, the smoky ham made in heaven in his pack. Talk about donkey and carrot. I thought I wouldn’t make it past the turning up to our little plateau above the village, but I kept going. The houses and pensions en route were still pumping out their own, edible breakfast smells, tempting me to stop and just lick the air. I didn’t. Up, up, up we went. I stopped at the final turn. The gradient was volcano-like and my legs were now worn and jelly. Pumping my arms I attacked it walking, every step taking me closer to breakfast. The car park flattened out and the last hundred metres I ran again, sprinting to catch up with Martín. I mean the ham. Which I did. 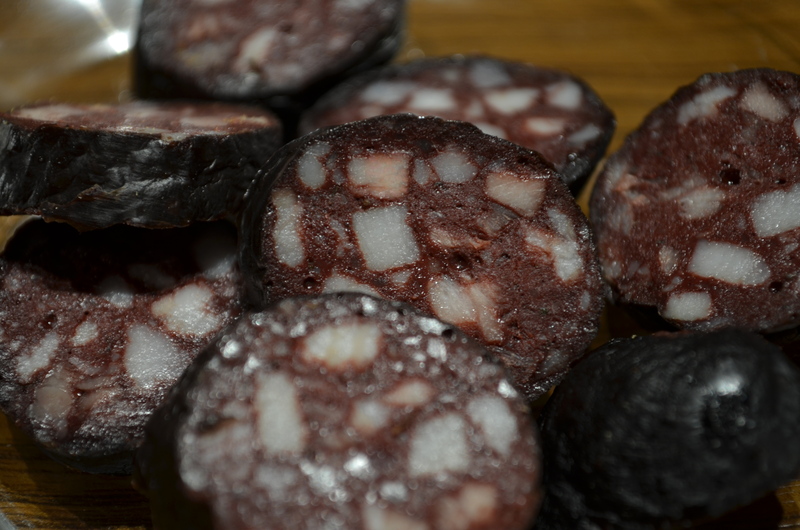 This is the black sausage from the area – also to die for. I was never quick enough to get a photo of the smoky ham motivator.